Top Russian officials welcomed Thursday a decision by the Court of Arbitration for Sport to lift bans on 28 of its athletes saying the ruling proved a state-sponsored doping system did not exist. “We are very glad for our athletes,” said President Vladimir Putin’s spokesman Dmitry Peskov. 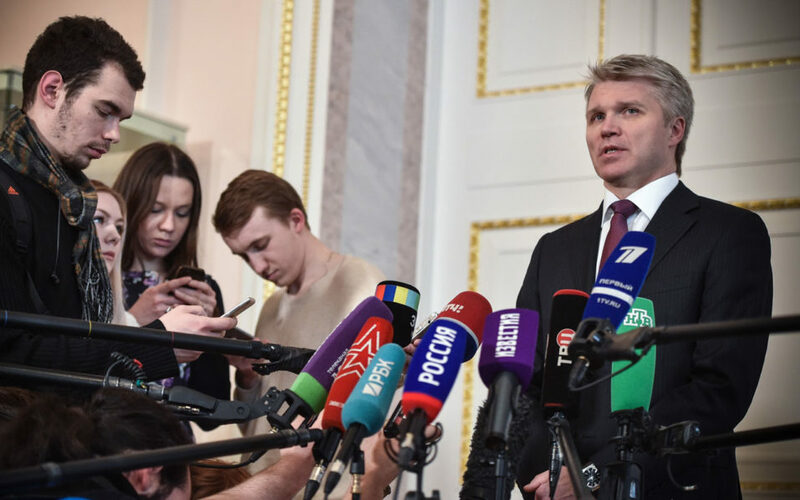 “The decision of the Court of Arbitration for Sport proves that energetic work to stand up for our rights in court and elsewhere — it is justified, it can be effective and it should continue,” Peskov added. “And we are hoping that this work will certainly continue,” he told reporters. Speaking at a cabinet meeting, Russian deputy prime minister in charge of sport said the Lausanne-based court finding proved Moscow did not have a vast state-sponsored system of doping in place, contrary to the McLaren report. “There wasn’t any system or any sort of manipulation at the Sochi Olympic Games,” Mutko told the meeting chaired by Prime Minister Dmitry Medvedev. “Today all the medals have been returned,” he added, noting that Russia returned to the top of the medals table at the 2014 Sochi Games. The deputy prime minister himself was banned after being singled out in the report and is now appealing to the court. “We never had any doubts that our athletes absolutely deserved their medals they won at Sochi. It is good that the court fully confirmed this and proved their innocence,” said Prime Minister Medvedev. Peskov said it was not clear whether the 28 Russians would now be able to take part in the Winter Games starting in Pyeongchang, South Korea, next week. “It is a difficult question,” the Kremlin spokesman added, noting Russian officials would continue talking to the International Olympic Committee. The Court of Arbitration for Sport lifted life bans on 28 of the 43 Russians accused of doping at the 2014 Sochi Winter Olympics. In a decision that could allow some of them to compete in the Winter Olympics, the top sports court ruled there was “insufficient” evidence that the athletes had benefited from a system of state-sponsored doping atin Sochi. The court also lifted the life bans of another 11 Russians but barred them from competing at the Pyeongchang Olympics that start February 9. “We will continue our peaceful legal fight for the rights of our athletes,” Peskov said. “As for the question about whether there were problems with doping or not — certainly there were, just like in many other countries,” he added. The International Olympic Committee has banned Russia from competing at Pyeongchang as a national team over the doping scandal, although 169 Russian competitors have been cleared to take part as neutrals. On Wednesday, President Vladimir Putin met with Russian athletes set to compete in Pyeongchang and asked their forgiveness for “not having been able” to shield them from the doping scandal. The ban against Russia was an enormous blow to a country which has always prided itself on sporting achievements. Russia spent around $50 billion hosting the Sochi Games, making it the most expensive Olympics ever.